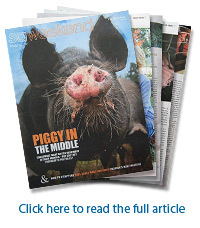 Readers of the SA Weekend Magazine in The Advertiser were given some food for thought this week with its cover story 'Piggy in the Middle', which takes an in-depth look at the rising consumer awareness — and discontentment — about how animals are raised for meat and eggs. The story looks at the little known emotional and mental abilities of farm animals and follows Animals Australia's factory farming expos�s and consumer awareness campaigns, which have been instrumental in awakening the Australian public to the alarming lack of protection, and consequently legal abuse, of animals raised for food. Animals Australia's critical campaigns and investigations are funded entirely by the generosity of our members and supporters who share our vision for a kinder world for animals. We would like to extend a heartfelt thanks each of our donors, without whom significant progress in the campaign to expose and end factory farming may never have occurred. Please help us continue the fight to free animals from suffering and neglect.